It's a Reverso pump. Like the name implies, it's reversible by changing the polarity. And expensive. I ordered it for a work project and it ended up being too large so was basically tossed out. Definitely overkill for what I'm using it for now but it works awesome. Without pressure head, it FLOWS. When testing before I connected it to the pan, I primed the pump and it blew oil about 10ft across my garage floor haha. I finished buttoning up some last minute things this weekend, tweaked the tune for my specific setup, tested all the outputs, and it fired first try! The only downside, the ECU seems busted. It's a common issue on the early MS3Pro Ultimates and Evos where something internal fries and the car idles super rich. I couldn't get it to idle out of the 10s AFR, no matter how much VE I pulled out of the fuel map. I've already contacted DIYAutotune and will hopefully have the ECU out for repair today. The only mechanical issue I noticed, the drives turbo seems to be leaking oil pas the seals. There was oil in that downpipe and compressor tube. BUT, I forgot I had the PCV system plugged off for storage. I ordered the stuff to plumb my catch can last night. Hopefully with no crankcase pressure, it won't push oil. I also got the wheels and tires mounted. I'm not sure if the 285s are going to clear up front. 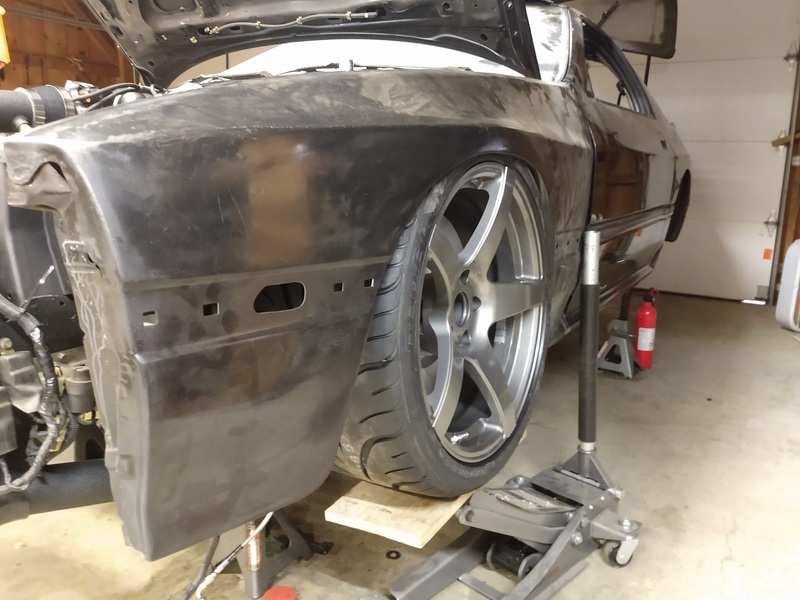 The picture shown is with -2.5* camber, which is about as much as I can get out of the knuckle/camber plate before the tire hits the coilover. I need to take the spring off and jack the tire into the fender and see how it clears. The fix is easy, it just has to be done by the manufacturer. I think everyone I know with a gen2 MS3Pro has had this issue by now. It’s really disappointing, but once it’s fixed they’re pretty bulletproof. I do know that the issue is exacerbated by trying to start the car with a weak battery. Knowing that, I had my battery on a tender all winter, BUT it sat for 2 years and is already 4 years old. Congrats on getting it going! I got the ECU RMA'd and in the mail. Hopefully I may have it back by the weekend. Unfortunately the 255/35ZR18 size for that tire is out of stock. I think I'm going to take a shot and buy another pair of the 285s and run them all around. 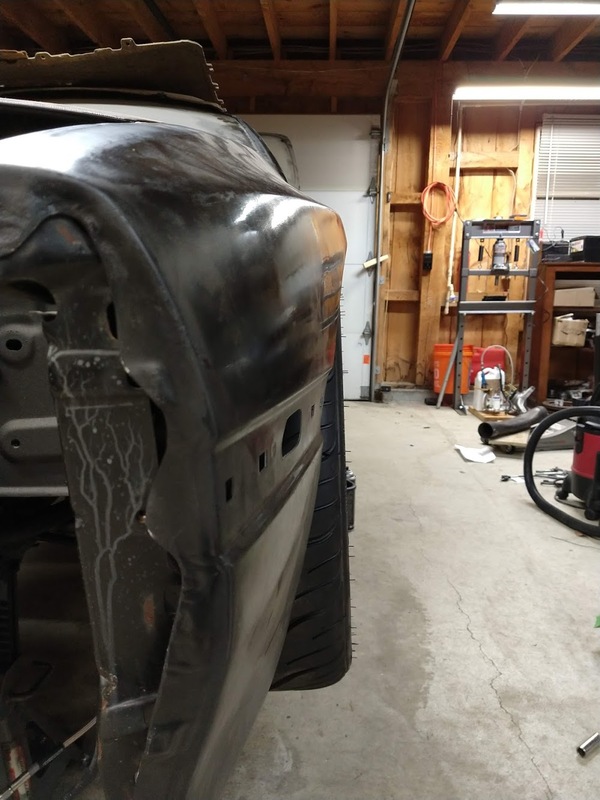 The fenders haven't been touched- I'm guessing there is some material that could be cut out if necessary. The other issue I want to solve soon, the car is waaaay too loud. It currently has 3" downpipes into 3" Dynomax race bullets merged into 3.5". Anyone have a suggestion for a reasonably priced muffler that sounds good and doesn’t kill power AND comes in 3.5”? FWIW, I ran race bullets into a typical fart cannon and it actually mellowed the sound out a LOT. 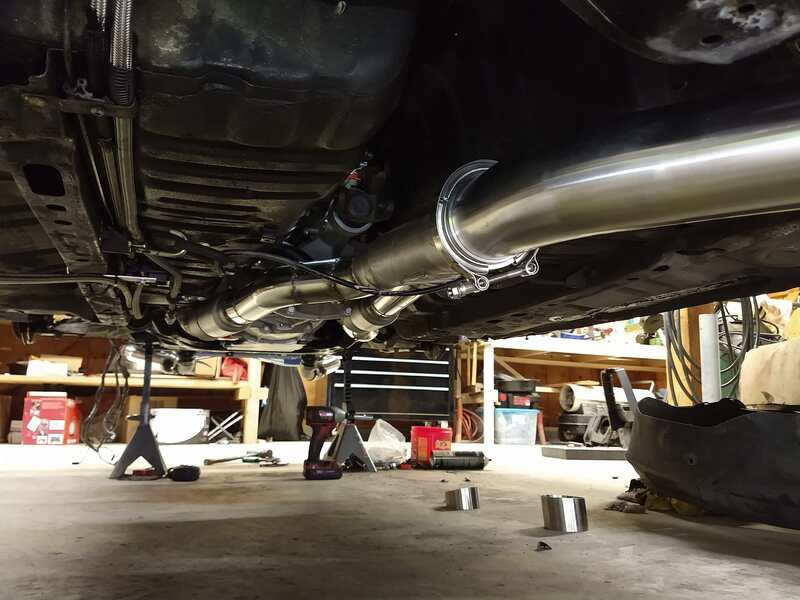 I'm planning to do race bullets (already have them) to chambered mufflers on the Mustang for a more low tone. I have full 3" duals with X-pipe, 2 Dynomax race bullets and 2 Dynomax Ultraflows. Sounds good, but not loud by any means. The Dynomax mufflers are much better built than Magnaflows in my opinion. I ended up buying a Dynomax Ultraflo 17224. 3.5" options are pretty limited but that looks like a good fit and all the sound clips I heard are similar to what I'm going for. I'm going to mount it in the stock passenger-side muffler location with a turndown. Not really any room for mufflers under the car, everything is tucked as high as I could fit it. It even necks down to 2.5"x4" oval under the subframe. Should sound nice and mellow with that muffler, though. That should be a good choice. My Ultraflows are welded together and mounted upright in the stock location, with upswept tailpipes. Looks kind of like a lot of old Italian cars used to do their exhaust outlets. Cobranut, I like that look a lot! Do you have any good videos? 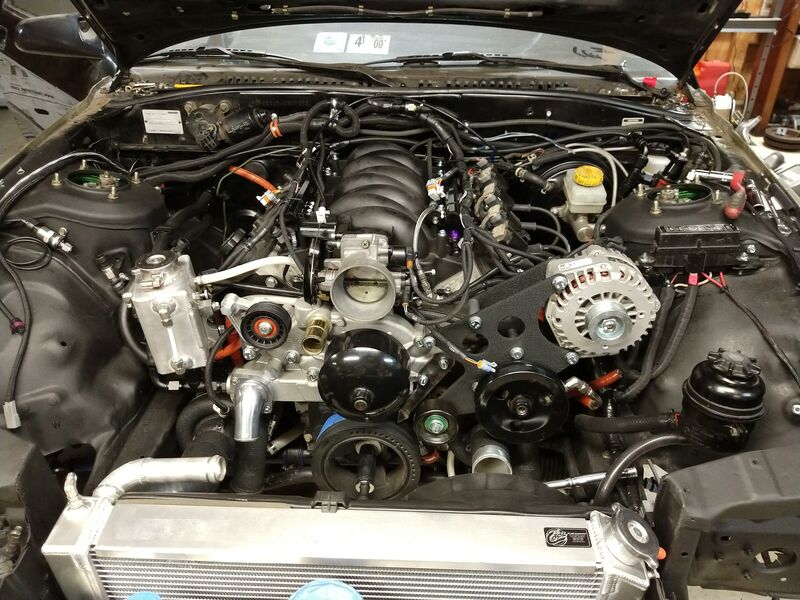 So could you give me some insight on why you chose LC9 5.3L over say the LS1/LS6 or LS3. Did you grab the small 5.3 knowing you were going to throw boost at it so size wasn't a big concern? 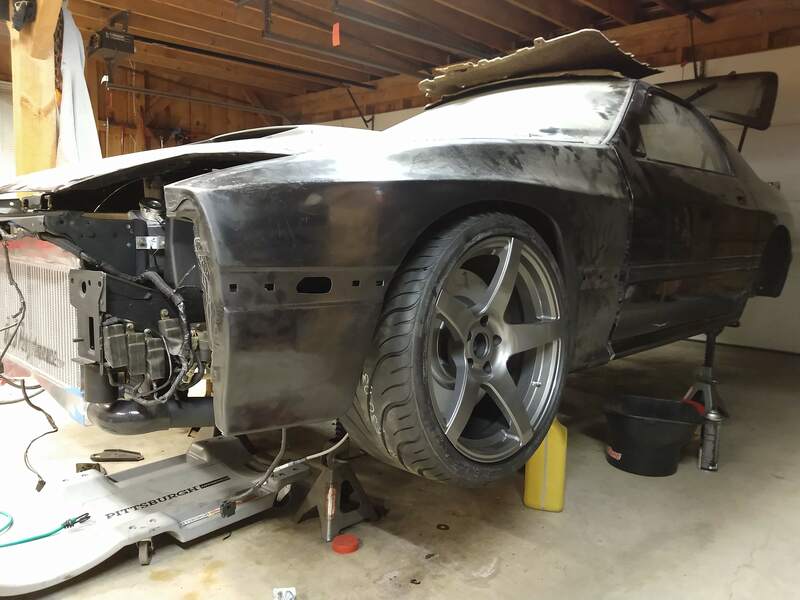 I'm looking over a couple different LS motor options, as I prepare for my swap. Trying to find best bang for buck, that will see boost. I kind of fell into the LC9, but yes, I knew I was going to boost it from the beginning. It’s probably the best value in LS engines, IMO. You get one of the strongest cast aluminum block GM has made (excluding the LS9/LT stuff) and the best OEM cathedral port heads (799/243). Siamesed bores, LS3-style rods, flat top pistons, 10:1 CR. The downside is, you’ll have to delete the DOD and sometimes also VVT depending on the year. The plus side, the DOD is usually why the engines get pulled in the first place. After you replace the lifters, valley plate, and cam, you have a lower-mileage engine for cheap. My current engine and backup engine both were pulled because of collapsed DOD lifters at under 100k miles and looked new inside. You’ll also need Gen4/58X-specific wiring which isn’t a big deal with aftermarket ECUs. I think that going 58X is a good idea in general as the Gen3 trucks are hitting 20 years old and the Gen4 stuff is going to continue to populate junkyards as time goes on.